The space for all students in Toulouse and its academy / The reception is provided in French, English, Spanish, Uzbek and Russian! Operational since 1 September 2015, the Welcome Desk has already welcomed, informed, advised and guided more than 145,000 visitors, high school students, university students and researchers from France and abroad! Its mission is to provide services and advice to all students. Studying and doing research under the right conditions requires addressing a range of concerns: housing; travel; access to cultural and sporting offers; protecting yourself against risks to your health and finding medical treatment; finding your way around a city, a region or a country that you are sometimes discovering for the first time; knowing how to get involved and take initiatives; working; obtaining administrative permits to study in France; knowing how to pursue your studies when you have a disability, etc. 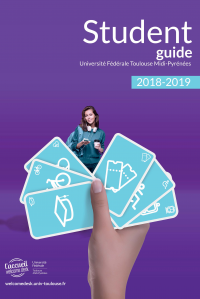 The Université Fédérale Toulouse Midi-Pyrénées and its university members and grandes écoles wanted to make life easier for students and researchers in Toulouse and Midi-Pyrénées. Services tailored to all requests. You can come and ask your questions directly to the officials of the Prefecture of Haute-Garonne, the Board of Education of the Academy of Toulouse, the CAF Haute-Garonne and the CROUS of Toulouse - Occitanie in a dedicated 300 sq. m. space. The Université Fédérale Toulouse Midi-Pyrénées team is also there to advise and explain how to find and rent accommodation, the cultural and sports offers available, means of transport, assistance for students with disabilities, how to look for a job, take care of oneself, take associative initiatives, and discover the course offerings of universities or schools in Midi-Pyrénées. It is at the Welcome Desk that the first meeting will take place for the students and researchers using the Toul'Box.